Ah, Christmas. It came and went so fast. That green sweatshirt from a well-meaning Auntie Fran just wasn't something you would ever put on your child.....in public. Cheap toys break easily, and even Santa might have gotten it wrong. Getting the perfect gift for your little one does not have to be that hard. It isn't too late to give your child something they will really love! 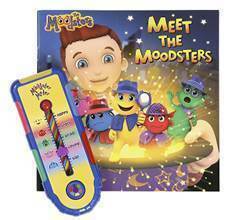 The Moodsters is a new line of toys and books designed to teach young children the fundamentals of feelings. The Moodsters, five lovable little detectives (Coz, Lolly, Snorf, Razzy and Quigly), come to the rescue whenever their friends, Zach and Zoey, have a feelings emergency. The stories and toys teach simple strategies to build social and emotional intelligence skills in young children. Emotional Intelligence (EQ) is defined as the ability to identify and manage one's own emotions as well as the emotions of others. Decades of scientific research has shown that children with EQ skills are better able to manage their thoughts, feelings and behavior. Feelings Flashlight™ and Storybook - an electronic flashlight that features The Moodsters character images with voice affirmations and fun play activities so kids can explore their feelings, helping them to process and understand their emotions. 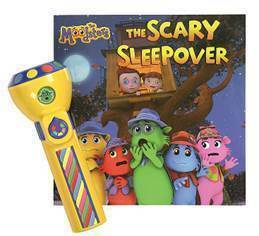 “The Scary Sleepover” storybook to complement the Feelings Flashlight with a story to take the “scary” out of bedtime. The night of the treehouse sleepover is finally here, but the backyard is full of spooky noises and dark shadows. The Moodsters help their friend, Zach, face his fears – and save the sleepover! Moodster Mirror™- an electronic mirror with character voices to help kids recognize their feelings and non-verbal cues, which is a key EQ skill. “A Time to Be Kind”storybook. Zach and his best friend, Sam, love to ride their bikes together. But when something terrible happens to Sam’s bike, Zach has a tough decision to make. With a little help from The Moodsters, Zach, learns how kindness can make things right in this heartwarming story that explores the true meaning of friendship. 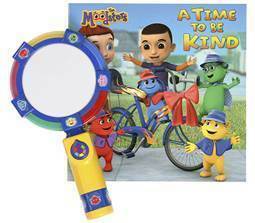 I gave my two year-old nephew, Wesley, the Moodster Mirror for Christmas. He ended up playing with it much more than any other toy he received! (And he opened quite a few gifts.) Wesley was mesmerized with the bright flashing colors and funny voices that the mirror made. He also loves the story book that came with it. His parents were very pleased as well at this educational toy for their son. Disclaimer: I received a sample of this toy to review and to keep. All opinions are my own.